Repeated allegations of systemic corruption have been made by independent politicians and journalists against sections of An Garda Síochána, Ireland’s national police service, since at least the 1980s. These accusations have ranged in severity from claims of undue influence on the force by the main establishment parties, the press and major business interests to out-right criminality by individual officers. These fears have been given renewed impetus in recent years thanks to a handful of conscientious “whistleblowers” in the organisation leaking stories of Garda law-breaking to attentive TDanna and Seandóirí. Of course the Gardaí, the Director of Public Prosecutions (DPP), the Department of Justice and the government as a whole (of whatever composition) have sought to limit the damage caused by these revelations rather than seek out their remedy. An internal investigation into allegations of gardai collusion in heroin dealing in a midlands town has found evidence to substantiate claims made by a police whistleblower in 2014. 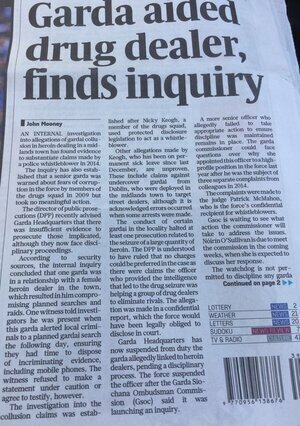 The inquiry has also established that a senior garda was warned about fears of corruption in the force by members of the drugs squad in 2009 but took no meaningful action. The inquiry noted that in one notorious incident the DPP was unable to proceed with the prosecution of a known drug-dealer because it concluded that members of An Garda Síochána in the small, rural policing division were helping a rival gang eliminate its competition. More than a month ago I was contacted by a serving member of An Garda Síochána who relayed to me very disturbing allegations in regard to Garda practices in the Westmeath division but not exclusive to that division. I subsequently met with this garda and have had a number of telephone conversations with him since. Garda Keith Harrison claims that as a result of arresting a member of the drugs unit in Athlone for drunk driving, that Garda management maliciously set out targeting him while the arrested garda was afforded protection by Garda management. He claims that a managerial review of his high work returns and practices was instigated and persons who had past interactions with him in the execution of his duties were invited by the Garda to make complaints against him. He claims that during this period from September 2009 until March 2011, he was office-bound while the garda he arrested, who had been found with a high concentration of alcohol, was still driving official vehicles and carrying an official firearm. Garda Harrison makes serious claims about how the drunk driving case was struck out of court on dubious rulings and how evidence relating to the case was stolen by a member of the Garda. He also claims that a member of the Garda of officer rank stationed in the Westmeath division prevented successful prosecution of individuals in a number of cases. On Monday, I met with Garda Harrison again. At that meeting there was also Garda Nicky Kehoe, who is another serving Garda whistleblower, and who has made serious claims in regard to the connection of a major heroin dealer in the Midlands and a senior member of the drugs unit. At that meeting copies of sworn affidavits were given to me from both gardaí. Garda Harrison claims that he had suspicions about a member of the Garda who was working within the drugs unit who may have been knowingly allowing the sale and supply of drugs within the Athlone district and that he had raised this with management, but he claims that it fell on deaf ears. One such story comes from a former garda called Jack Doyle. His story gained some attention around 2000. He revealed some serious drug involvement by gardaí in the Cork area and at the time the Garda authorities confirmed that undercover gardaí had been involved in the importation of illegal drugs into the State in what they described as controlled operations. However, a spokesman said that these operations were necessary in order to bring the leaders of criminal drug gangs to justice. Garda management rejected calls for an inquiry into claims made by Jack Doyle, saying nothing inappropriate had occurred. He recounted to me how they had many opportunities to arrest the boss of the criminal gang but failed to do so. When asked why, he replied, “They have a senior garda in their pocket.” He then recounted an incident in Rosslare when he was returning with a shipment of drugs. A customs officer stopped him and was about to search his jeep when two plain-clothes gardaí commandeered the jeep and drove out of the terminal at speed, being pursued by customs officers. A high-speed chase ensued and the gardaí lost their pursuers. As a result of this incident he said he would never personally bring drugs in again. He then proceeded to tell me about the many runs he had done, bringing in cocaine, ecstasy, cannabis and firearms. Massive amounts of drugs were coming in and quantities were allowed to get into the hands of the criminal gang. He told me how he was being well looked after financially by both the criminal gang and the gardaí. Their careers have progressed and one of them is now an assistant commissioner. He was appointed by the former Minister, Deputy Shatter, and this same individual was involved in the Boylan case which entails a very similar story to Jack Doyle’s. Jack Doyle’s career did not progress. He turned up at his place of work one day and was told, “Jack, you’re not coming in here. You’d better go home. You’re finished, Jack. But, listen, you’ll be grand; we’ll look after your pension.” He was forcibly retired. That one of the gardaí involved is now an assistant commissioner – he could actually be the next Commissioner – emphasises how important it is that the new Commissioner should come from outside the State with a new hierarchy built around him or her as otherwise problems will not go away. “Senior Irish police officers planted fake IRA bombmaking equipment and ammunition on both sides of the Northern Ireland border to reap praise for “discovering” them, according to a report published yesterday.